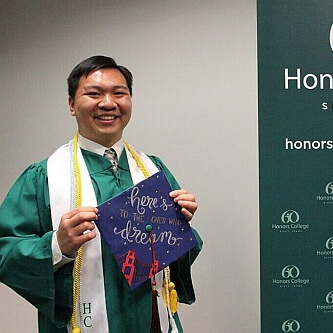 While most 18-year-olds are receiving their high school diplomas, Honors College student Matthew Suandi instead earned his Michigan State University degrees in economics from the College of Social Science and mathematics in the College of Natural Science. Suandi credits much of his success to his parents, who always encouraged him to take pride in his work and do his best, either in the classroom or with additional lessons in math, history, and science. Suandi skipped 2nd, 4th, and 7th grades for a more rigorous education experience and he considers a highly responsive school administration to be a contributor to his success as well. Upon arrival at MSU at 14 years old, Suandi focused on striving to do his best, and did not pay much attention to the noticeable age gap. His passion for learning did not go unrecognized by professors; Suandi co-authored a research paper on microfinance with Associate Professor Christopher Ahlin. In addition, his quantitative research with Assistant Professor Elizabeth Mack was published in a peer-reviewed journal and presented at the Uddevalla Symposium in London. Suandi is now headed to the University of California-Berkley to pursue a doctorate in agricultural and resource economics, specializing in development economics and energy/environmental issues. He is a recipient of the National Science Foundation Graduate Research Fellowship, a prestigious award that will help him conduct research in the economics field. He is most proud of this accomplishment because he is the first to represent MSU’s Department of Economics since his own mentor, University Distinguished Professor Peter Schmidt, received the fellowship 50 years ago. Suandi said he believes his time at MSU has prepared him to be a graduate student, and is excited to prove himself to a new set of faculty and peers.